…25% of the world’s population is under the age of 14 and in some parts of the world it’s over 50%. It’s terrifying and exciting at the same time. The implications of this for our shared future and the public policies we need to manage this are tremendous, but, if we re-frame this and get it right, so are the opportunities. Imagine a world where a huge generation of youth and energy is ready and willing to help shape a world that so many of us want to see. A world in which extreme poverty is eradicated, inequalities are reduced and where we are actively working together to combat the threat of climate change. These are the ambitions of the the Sustainable Development Goals (SDGs), the Global Goals of this young generation, and at Project Everyone, led by filmmaker, campaigner and UN SDG advocate Richard Curtis, we believe these Goals form the perfect toolkit to enable us to make turn this global generation of young people into movement fighting for change. Luckily we aren’t alone and educators across the world are lining up in support of this mission. They are led by those such as Professor Fernando Reimers of Harvard Graduate School of Education and Sir Ken Robinson, the popular creative educationalist whose TED talks have been viewed over 50 million times. They believe that the wider education community has the obligation to make sure that all students in schools take part in some form of Global Education – whether it’s part of a curriculum or not, and that we must find new and different ways to do it. There are lots of different practices and pedagogies in Global Education and ours uses the United Nations Sustainable Development Goals as the framework. We call it the World’s Largest Lesson. This is a programme brought to life by Project Everyone, with the help of two lead partners – UNICEF and the new BE FEARLESS BE KIND philanthropic initiative from Hasbro. •The need to raise awareness and support for the UN Sustainable Development Goals throughout all sectors of society so that citizens hold governments to account for their achievement. •The opportunity to turn what could be viewed as 17 abstract Goals into a tangible plan for people and planet by grounding them creatively in the everyday worlds of children and young people. •The increasing need for children to retain and hone their natural sense of compassion and empathy as they grow up and become influenced by the wider world around them, so that they feel confident and driven to turn their knowledge and understanding of the Global Goals into action. Blending these concepts enables children and young people to take action for positive change in their local communities, all in the name of a powerful global ambition that 193 Heads of State have committed to achieve by 2030. It’s “Think Global, Act Local” made relevant for today. Every year, at this time, as we mark the ratification of the Goals in 2015 and our progress towards 2030, we encourage all those who connect with children, either professionally or as caring adults, to take part. So far this programme has hit home in countries as far apart as Argentina, Hungary and Cape Verde. 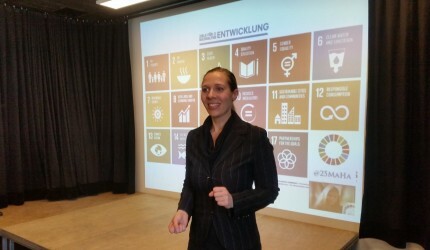 International school groups such as Nord Anglia Education have embedded it into their curriculum, youth organizations such as AIESEC have created a program of peer to peer education in which youth members visit schools to introduce the Goals to both students and teachers, and employee volunteers organizations such as Impact 2030 are visiting community schools they connect with to do the same. Since 2015, millions of children have taken part in lessons about the Global Goals. They have developed their own ideas for taking action. Some are personal pledges to change something in their own lives, some are group projects to change something where they live or to bravely advocate for change on behalf of others who need help. In response, children are rising to the challenge too. There is a logic and order to the Goals that appeals to them and their comprehensive nature means there is a Global Goal for each and every child to direct their creativity, passion and kindness towards. 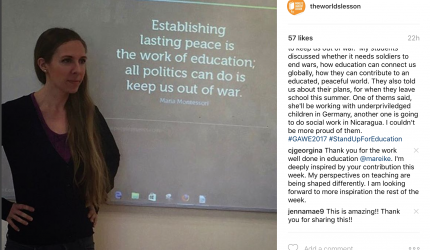 This moment is bigger than classrooms, communities and countries, it’s the World’s Largest Lesson and if we work together to get it right, then social activism will no longer be just for the leaders in a class or niche interests. It will be for everyone! 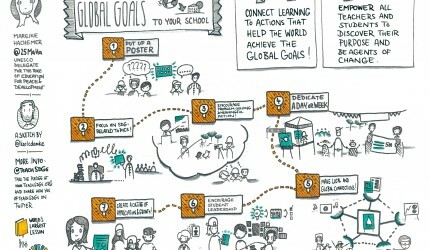 For more information visit www.globalgoals.org/worldslargestlesson and join our educator community on twitter @theworldslesson #teachsdgs.